Put orange juice in a 1-pint measuring cup. Hold tablespoon over measuring cup and squeeze the grated ginger to obtain 2 T of ginger juice. Discard the squeezed ginger gratings. Add the ginger juice, tamari and oil to the orange juice. Stir with fork to combine. Adjust seasonings if desired. Makes 1 cup. Pour maple orange glaze over tofu and simmer for 5 minutes. Glaze will thicken. Flip over tofu and continue simmering for another 5 minutes or until tofu absorbs glaze. While tofu is simmering, add noodles to boiling water, and cook 10 minutes. Drain and rinse in cold water. Set aside. One by one, dip the dried rice papers into a shallow bowl of hot water, leaving submerged long enough to soften and turn white, about 40 seconds. Then carefully remove, and spread out on a dish towel. Put about a quarter cup of noodles in the center of the rice paper rounds. Top with about a quarter cup of watercress, and 3 pieces of tofu. Fold the bottom edge over the tofu. 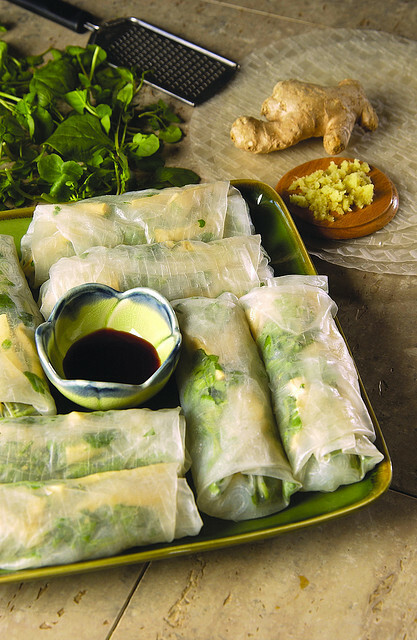 Then fold in the 2 sides, and roll tightly into a cylinder, taking care not to tear the rice paper. Repeat until you use all the filling and wrappers. Serve immediately.